“Life of Lieutenant Colonel James A. 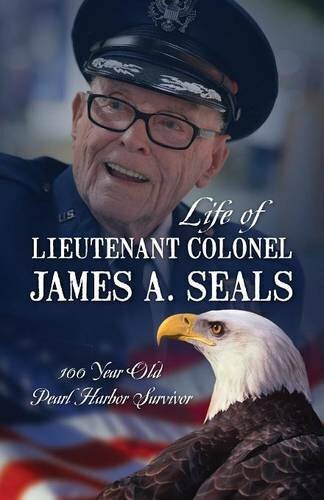 Seals: 100 Year Old Pearl Harbor Survivor” is the memoir/biography of James A. Seals, as compiled by his daughter, Michele Seals McConnell. Seals, a 100 years old World War II Veteran and survivor of Pearl Harbor, relates his personal memories of growing up in the early 1900s, his education, military life and family life. A large portion of the book is related to his shining military career and service to our country. Indeed, his experiences are rich in historical significance and the pride of his participation shines through in the retelling of events. Military history buffs will appreciate the first hand accounting of some of the most well known (and not so well known) events of the times. As someone who devours information about the lifestyle and times of a younger America, I thoroughly enjoyed the personals stories of Seals’ childhood and growing up in a rural Tennessee town. As to the actual writing and formatting, the memoir reads like a first draft and would benefit immensely from a thorough editing and proofreading process. There are numerous grammatical and spelling issues that take away from the overall connection to the story that should have been caught, even by a quick read-through of the story. Editing issues aside, “Life of Lieutenant Colonel James A. Seals: 100 Year Old Pearl Harbor Survivor” is an endearing treasure of memories of a life well lived, holding particular interest to fans of military history and life in America in the early to mid 1900s.